Unlike so many of the other fitness waters this one tastes good. Yes, you can taste the sodium ever so slightly - but that's how the electrolytes are charged! The cherry taste is from natural flavors and it is colored from vegetable juices. One bottle contains 15 grams of protein from whey and hydrolyzed collagen - which is produced from animals, so this is not for vegans. Just 70 calories and 2 grams of carbs. This is one simple solution to add more protein. Weight: 16.9 oz. 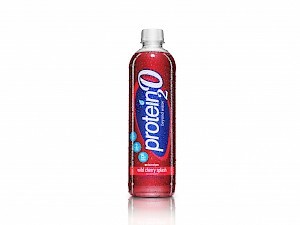 Protein2o Inc.